I’ve noticed that I’m using personas, especially the empathy mapping component, more frequently and fluidly in my work. I posted a daily dispatch about this in late August. I often share this introduction to empathy mapping with others if they are curious or I want to use the tool with them. I recently project managed the refresh of the Learning and Performance Institute’s Learning and Development Capability Map (yeah – it’s a mouthful – #LPICapMap rolls off the tongue easier). The updated Map will be live in October 2018. Our process evolved during the project and we realised that we needed to engage experts and leading practitioners around the globe to write or update skill descriptions. We had a limited timeframe for our 40+ volunteers to produce their deliverable. I set up a Slack group and added a channel for each working group. I’m convinced that using this tool was critical to enabling the working groups to effectively work together under tight deadlines, and we would never have me the deadline if we had used email alone. This is a non-work example of learning as a by-product of an activity that has many other purposes – amongst them a bit of family fun. I recently stayed with my parents overnight. My 92 year old grandmother lives with them. 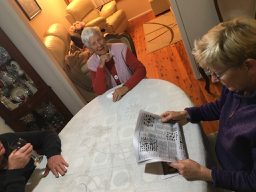 After dinner every evening my mum gets the daily quiz from the newspaper and whoever is there joins in answering the questions. It’s great with social bonding, helps keep my grandmother’s brain active, and we all get to learn a little something and feel closer in the process. Thank you Mum! What about you? What is something you’ve learned recently? How have you been learning? What group activities do you build learning into or see it as an incidental outcome?